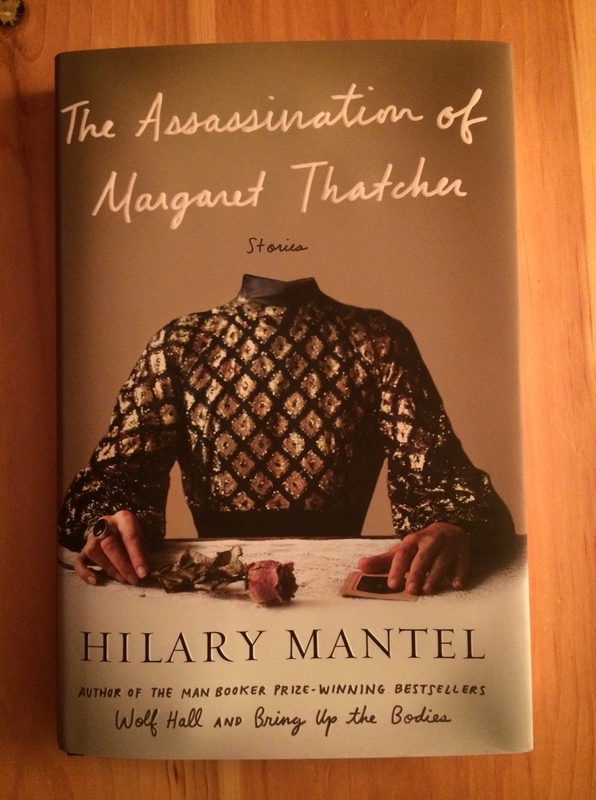 Yes, I’ll talk about the controversial title in a second, but let me say this first: at one point, I looked up from reading this book and said to my husband, “Hilary Mantel is unbelievably good.” One look at my face and he replied, “That good, huh?” Yes, that good. Now, about the title story, which is the last story in the collection: it’s a good story, a fascinating premise. It does not depict the assassination of Margaret Thatcher, but the narration makes it clear that in the story’s alternate timeline, the assassination happened. The story is an examination of character, of history, of choices. The narrator, a woman who lives near an eye clinic where the Prime Minister has had surgery, lets in a man she thinks is a plumber, but who turns out to be an IRA operative. He holds her as a semi-willing hostage, and the pair discuss what he intends to do. It’s chilling and strange, and none to flattering toward Margaret Thatcher, who is still a divisive figure in the UK (Baroness Thatcher died last year), where the controversy over the story is much louder and nastier than it has been here (there have been Orwellian calls for Ms. Mantel’s imprisonment, for example). However, I imagine that if a similar story had been published here about Ronald Reagan so close to his death, the commentary would be just as deafening. As a girl, I loved reading about Margaret Thatcher; I considered her a role model, since at the time I wanted to go into politics (also astrophysics—ah, the follies of junior high). Now, as an adult, I admire her in some respects, though I don’t think I’d find her domestic policies agreeable. What I’m trying to say is that I have no ill-will toward Margaret Thatcher, and my only objection to Ms. Mantel’s story is that though it depicts Margaret Thatcher as a public figure, not a private person, it should perhaps have been held back for another year or two in deference to Baroness Thatcher’s family’s mourning. By the way, I do not know who chose the title for this collection of stories, but the cover suggests to me that the American publisher, in any case, is not at all alarmed by the prospect of controversy, and perhaps welcomes it. Most stories in the collection have been previously published (the oldest, by publication, dates back to 1993, but most were published after 2000), and their contemporary settings will come as a surprise to anyone who is familiar with Ms. Mantel’s glorious rendering of Tudor England in the Booker Prize-winning novels Wolf Hall and Bring Up the Bodies. In “Sorry to Disturb” (which, incidentally, I think would have made a better title) a woman living in Saudi Arabia comes to regret allowing a stranger in to use the phone, which leads to an increasingly awkward series of social encounters. Another story, “Comma,” finds a young girl and her slightly older friend sneaking around an invalid’s house; rarely have I found a child-narrator so interesting. “How Shall I Know You?” finds an author on a dispiriting stop of her book tour, alternately loathing and pitying the people around her. The last line of the story took my breath away; was a good story up to that point, but the last line made it blossom into something magnificent. Other characters in The Assassination of Margaret Thatcher* include a girl watching her sister slowly die from anorexia, a philandering husband, a traveler on a train who sees her father’s ghost, and couple on holiday who leave too much unsaid. These stories are often grim, often chilly, and often funny. The characters tend toward the grotesque, but reveal just as much about the reader as they do about themselves. And oh lord, the language. Ms. Mantel’s images are detailed, strange, perfect. A girl’s twisted hair ribbon makes “her head [look] like a badly tied parcel” (40); table linen is fringed “like the ears of a teddy bear” (25); “big eyes—unripe fruits–were bulgy with incomprehension” (107). In context, they can be eerie, or funny, but they’re always illuminating. Hilary Mantel is an absolute wonder. If you like short stories and exquisite writing, don’t miss this book. This sounds wonderful! I haven’t even read her other two Booker Prize winners yet but maybe I’ll start with this one. Wolf Hall & Bring Up the Bodies are so, so good; but this book is much shorter, so you’re right, it might be a good idea to begin with this book. She also wrote a very short novel called Fludd, which I enjoyed. Ahh now you’ve made me want to read it even more. I also looked up to Margaret Thatcher—and still do though, like you, I’ve learned more about her time in office now. I’m not usually a fan of story collections, but if the writing is as good as you say, I think I’ll enjoy it. Great review! Thanks, Ariel! I think you’d be very interested in Wolf Hall, too–lots of questions about faith. These stories sound great! I’m not so sure about the cover, though. I still haven’t read any of her books. Which was your favourite? Well, of those I’ve read, Wolf Hall is the best. I started (but had to return to the library) her memoir, Giving Up the Ghost, which I think might be right up your alley, actually. Oh my fur and whiskers!!! Sounds like an amazing book! I’m going to have to get this. Love Hilary Mantel. I have managed to track this down and read it, thanks to our Anglophone book exchange group. My brief thoughts: 1) I couldn’t read School of English. I tried twice and had to put it down because it was too upsetting. 2) The title story was brilliant, in concept, execution, and writing. 3) I suspect this was published to pacify those of us who are dying in anticipation of her third Cromwell book. Completely, totally, 100% agree on #3. I check Amazon once a week to see if it’s up yet.